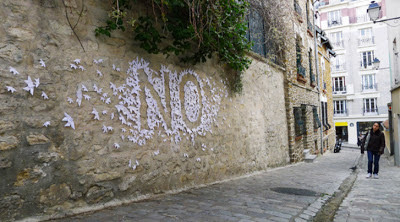 Mademoiselle Maurice is a street artist based in France that uses unlikely materials to make beautiful art. 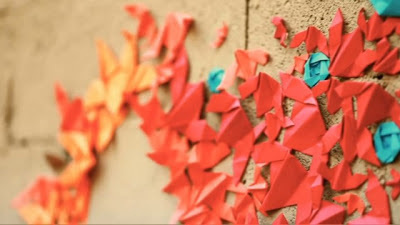 Her main body of work is created with origami (a old paper folding art form) embedded into the wall. This use of such crisp geometric shapes contrasting against the distressed stone walls that she primarily works on creates a striking image. She focuses on negative space to show her message, and composes the piece in such a way that it flows beautifully. I love how they look like they've just grown on the walls. Also, I love how they're just so colorful! In case you're curious, here's a video of the installation process. She also does some very awesome indoor installations, so you should defiantly check out her portfolio.